This gift box is the perfect collection of Rubs & Spices. Unique, quality gifts for engagement parties, groomsmen gifts, wedding showers, house warming, gift baskets, birthdays, anniversaries. 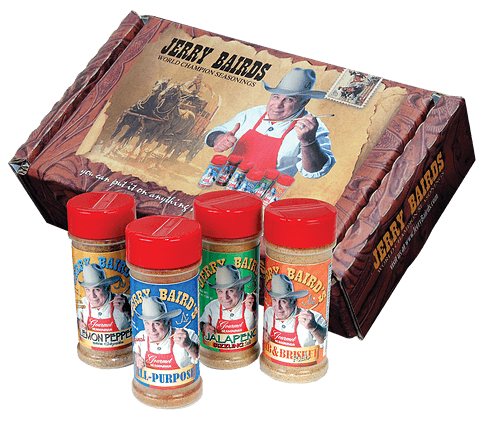 Tell someone “I love you,” or, “Thank you,” or, “Thinking of you,” in an unforgettable way by giving them a Jerry Baird’s custom made gift pack. Mix and Match any 4oz seasoning by contacting us by phone (given in “contact” tab). These seasonings go well for all occasions, whether you’re cooking for a special occasion or just back yard grilling. 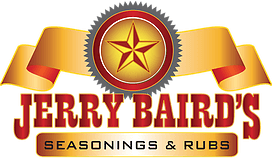 Includes Rib & Brisket Rub (4.6 oz), Jerry’s Best Jalapeno Seasoning (4.8 oz), Butter Flavored Lemon Pepper w/ Chipotle (5 oz), Champion All Purpose Seasoning (Original – 4.5 oz).